This week a very interesting article was published in the Guardian, referring to a study that shows lower profile shoes with less cushioning can actually help reduce injury. It’s a very interesting topic and as a big fan of lower profile shoes to help promote mid-foot contact and this it strikes a cord. It’s a small study and every one of us has a different bio-mechanical makeup, so less cushioning might not be right for everyone, but it is interesting nonetheless. We’ve copied the article below for you to read or you can find it here. 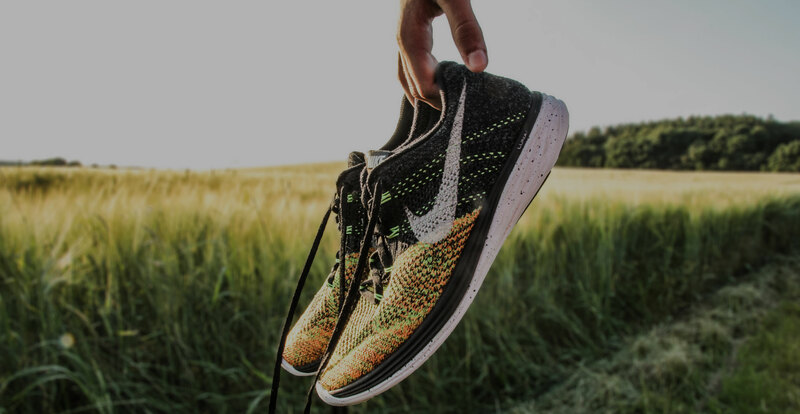 Runners who wear trainers with no cushioning and land on the ball rather than the heel of the foot significantly reduce the risk of injury, according to a study. Researchers compared how quickly the force acts when runners’ feet hit the ground – known as the loading rate – which has been shown to influence injury risk. The study of 29 runners, published in the Medicine & Science in Sports & Exercise journal, found significantly lower loading rates for those who wore so-called minimal trainers and landed on the ball of their foot, compared with people in normal running shoes, regardless of whether the latter landed on the heel or ball of the foot. The lead researcher, Dr Hannah Rice of the University of Exeter, said: “So many people use running as a means of reducing the risk of chronic diseases, but about three-quarters of runners typically get injured in a year. Running continues to grow in popularity but injury rates have not fallen despite decades of research aimed at reducing them. Runners in cushioned footwear tend to land on the heel – known as a “rearfoot strike” – while those who run barefoot are more likely to land on the ball of the foot – a “forefoot strike”. Rearfoot strike runners experience an abrupt vertical impact force each time the foot hits the ground. The impact force is often missing when running with a forefoot strike, but previous research has shown that forward/backward and sideways forces can be higher with a forefoot strike, meaning the total force is similar. Total force seems to be similar between foot strikes if wearing modern, cushioned trainers. “This seems to suggest that, for runners in traditional, cushioned running shoes, foot strike pattern may not matter for injury risk. “However, we suspected that the same may not be true of runners who regularly use minimal shoes, which don’t have the cushioning provided by traditional running shoes,” Rice said. Any transition to new footwear or to a different foot strike pattern should be undertaken gradually and with guidance, she said. The research was conducted at the Spaulding National Running Center at Harvard Medical School. “We found that when running in trainers with no cushioning and landing on the ball of the foot, the loading rate is lower than when running in cushioned shoes, however you land,” Rice said. Minimal shoes, Rice said, have very little or no cushioning, a heel-toe drop of less than or equal to 4mm (0.16 inches), and a stack height of less than or equal to 16mm. “This is information which manufacturers and footwear shops should be able to provide,” she said.